Detroit Horse Power founder and equestrian, David Silver, is interviewed by Romy. Learn about the passion for children behind the vision and the expansive potential impact of this great social enterprise! Romy: Let’s get started. David, will you first tell us about Detroit Horse Power? Then, we’ll dive back into the history. David: Sure. 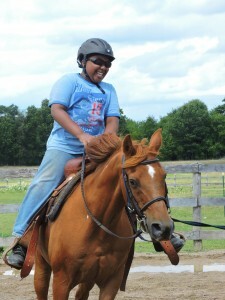 Detroit Horse Power is a nonprofit I started to expand opportunities for kids who live in the City of Detroit by teaching them valuable life lessons through riding and caring for horses. Our long-term goal is to combine this powerful youth development opportunity with vacant land revitalization by building a new urban riding center on some of Detroit’s vacant land, the unused space in the city. We’ve experienced significant population decline over many decades, and it’s left a real burden on communities and turning that burden into a community asset. It’s a really exciting opportunity for our long-term plans. Romy: That’s good. Right out of the gate, we got two really cool social missions. Here we go, the youth development with caring for horses and rehabbing the vacant land. I know you’ve got a background in horses because we’ve talked a lot. Will you take us back to how this evolved? David: I grew up as a competitive horseback rider in Westchester, New York. The sport I grew up riding in is called Three-Day Eventing which is actually an Olympics sport. I was fortunate to have a supportive family and a horse of my own. We were able to get a lot of training, traveling, and competing, and setting goals, and working hard to achieve them. It wasn’t until later, I ended up taking a bit of a break from horses to make the most of my college experience. I went to Dartmouth. Then, I moved to Detroit in 2012 through Teach for America. As I was seeing the tremendous needs for our kids in the City of Detroit who have so many obstacles stacked against them whether it’s unstable neighborhoods or families moving around a lot or not able to meet kids’ needs, I saw a real important need for more safe and enriching space outside of school that are giving kids skills that set them up for future success. All of this was going on while space I had from my childhood experience with horses allowed me to reflect on the powerful ways horses have shaped who I am today. Things like the confidence that comes with riding, responsibility for another living being, and perseverance to not give up when things get hard. There’re so many powerful life lessons that horses can teach us. It became a natural next step for me to combine this powerful background in my story with my passion for expanding opportunity for Detroit to use. Romy: That’s good. Before we go further into the social mission, what made you think about staying in Detroit to do it because there’re not horses walking around the city? David: It’s a unique opportunity. First of all, I feel very fortunate to have been placed in Detroit. I didn’t know very much about the city, and I don’t have any family in Michigan, but I feel a very strong connection with the City of Detroit and the hardworking people who are doing incredible things to build a strong future for residents. What became the most compelling opportunity, in my mind, is horses combine the research-based therapeutic effects for at-risk youth, among other populations, in need with a large space requirement. They’re big animals, and they take up a lot of space. In most cities, that would be a deal breaker because most cities don’t have large amounts of open space for a large riding center. In Detroit, that actually really matches a big need that’s going to help build a strong foundation for all of the Detroit to have a strong future. Where this wouldn’t be possible hardly anywhere else in the country, horses are uniquely positioned to address two persistent problems for the City of Detroit. Romy: Yeah, and oh my gosh, there’s so many questions I want to ask you right now because I know we’ve been talking about the need for places to store houses here too, but let’s stay on the social mission for a minute and this therapeutic piece with the kids. You’ve already done some pilots. You’re not officially open the way you want to be yet because of some ordinances and we’ll talk about that in a minute, but you’ve done some pilots, and what’s the progress or the types of things you’d like to see that the youth would experience when coming through working with horses? David: We’ve done two pilot programs so far. Last summer, we launched with two five-day summer camps that brought a total of 18 kids from the city out to existing horse barns outside Detroit. Like you said, it’s not how we’d like to be doing things long term. Transportation becomes a big barrier to our work, but it’s the best way we can, at this point, show the interest and the impact of horses for kids in Detroit. These experiences have been really powerful, even in the short span of time because this is not something that’s regularly afforded to our kids in Detroit. The excitement, and the enthusiasm, and the recognition that this is a really special opportunity is very clear. Then, we start to talk about the social and emotional growth that participants experience and given that it’s a pretty short time horizon, but even in the camps we did last summer, we saw a tremendous amount of self-confidence that comes with overcoming fears. A lot of our kids have not been around horses or other farm animals before and there’s a lot of anxiety that comes with these new kinds of experience, not unlike approaching a new academic topic and being really intimidated. Do I have the skills? Am I talented enough to do this? With the right kinds of support and with the natural talent that our kids in Detroit bring to the table, they can really thrive. By the end of the week, we had everybody riding independently. Some were trotting and doing posting trot independently which is not a small feat when you’ve only ridden four times. We just have such talented kids in the City of Detroit, and I’m really excited for what the future holds. This year, we’re going to be growing to six weeks of pilot programs with a total of 75 participants as we continue to build out measurements or how powerful this can be for our kids and demonstrating what we can do in the future. Romy: There’re some institutions that do have some measurements specific to horse therapy, right? David: Yeah, there’s a great work being done in the field of Equine-Assisted Psychotherapy, which is not particularly what we’re doing. That involves having a trained mental health professional that’s helping a client achieve some therapeutic goal but there’s great work being done and best practices that we’re able to incorporate into our work. As well as really wonderful urban riding programs that are already working in other cities. You see Philadelphia has two programs. Los Angeles has about a half dozen. There’s one in Hartford, Connecticut. It’s not currently available for Detroit’s youths, and that’s what we’re working very hard to make possible. Romy: That’s so neat. There’s a whole different language around this; I realize as you started to say “equine” and some of the other pieces that horse enthusiasts would really have down there. Sorry if I messed that up a little bit. What about the land? Let’s just go and tackle that piece for a second. Will you fill us in about maybe how much space that you need for boarding horses and riding them? What kind of space are you looking for and what issues? Let’s share with the listeners what’s happening with the ordinances and how you’re leading that? David: We are looking for 15 to 20 acres of open space that’s located in the community that supports horses as part of the neighborhood’s future. We are looking to be close to kids because transportation is a barrier in Detroit and we need to look at the environment, things like soil contamination that could be harmful to horses is a big concern. We are going through site selection right now and have about a half dozen sites that we are highly interested in, and we’re working with city officials to explore those opportunities. The biggest hurdle though is, like you said, the city ordinance as it stands now prohibits horses and all other “livestock” in the city limits. You’re allowed to bring them in now for up to 48 hours, and there’re certain exceptions carved out for circuses and laboratory research as it turns out but there’s been a movement for the last few years to create a new urban livestock ordinance. This was actually first in the conversation around the 2012 Urban Agriculture Ordinance. Animals were a bit more controversial, and they really needed to pass regulation to give firm legal standing to urban gardens which have been proliferating in Detroit for decades, but there are people keeping animals right now, chickens, goats, honeybees. They’re doing it because they want to make productive use of vacant land, and they want to be connected to where their food comes, and they want the educational benefits of the powerful lessons we can teach our kids through these amazing animals. The city is getting close to releasing a draft of a new Urban Livestock Ordinance, which I’ve been actively involved in. The ordinance is going to focus on smaller animals; thus, chickens, goats, rabbits, and honeybees with other animals like horses able to be approved on a case-by-case basis which makes sense to me given the large scope of our proposal and the many different considerations for keeping happy and healthy horses in an urban environment. Romy: I know this discussion about agriculture, and horses and livestock in the city have been ongoing off and on for a while, but it seems like when you joined up here, you had a hand in raising it and elevating it a little bit because I noticed, there’s a lot of talk about it. Maybe tell us a little bit more about what specifically you’ve been doing. David: I would say that I feel fortunate to have joined the process and the many people who are very dedicated to this issue, and feel fortunate that I joined at a really important time because this has been in development for a number of years, and the city is looking for creative solutions that take the burden of vacant land and turn it into something valuable that increases opportunity for residents. A large scale horseback riding proposal had not been on the table. City officials have reacted very positively to what we’ve shared. Certainly, there are very legitimate concerns about nuisance, about odor, about pests, about runoff, about animal welfare, about regulatory burden, but all of those can be easily addressed, and I’ve actually written a 30-page urban horse care best practices report which I share with city officials. My role is real to provide our elected officials with the information they need to make an informed decision to let them know that horses can provide a powerful benefit to our kids and our communities, and to stand in solidarity with the great folks that are doing this work and advocacy. Romy: That probably ties in rally nicely to the next part as we transition into what the enterprise model might be once it gets going. Part of, I guess, the sell of the concept of the city is about the residents here are boarding horses outside of the city, right? David: Right. As I’ve gotten to know the Metro Detroit horse community, people have tended to fall into three broad categories. Either they’re living in and around Detroit and they board their horse quite far away, up to 50 miles away that they’re commuting on a daily basis which is a huge burden on them, and their time, and their money, or they can’t stand that commute and they’ve moved further out into more rural areas of Michigan to be closer to their horse, or they’re living in Detroit because they care about the city and want to be a part of it through vitalization but they’re disconnected from their passion. Creating a new opportunity for people to keep their horses at a high quality and conveniently located facility is a really exciting opportunity to combine this powerful youth impact with filling a market need. By addressing this gap for boarding services, we can increase our financial sustainability so that if there were some disruption in philanthropic support for Detroit Horse Power, we would still be able to keep the lights on and keep our doors open, and keep serving youths because we have a study base of earned income that keeps us afloat. Romy: That’s so smart. I personally know quite a few folks who put their horses out by places that I live. I live outside of the border but yeah, there’s a lot of people who complain about the commute and would love something like this. It’s got to be part of the south of the city, and they’ve got to be [inaudible 00:13:22]. I think that would be a good thing to keep more residents here locally. David: Right. You’ve seen Mayor Duggan has defined his mayoral term about whether the city is going to shrink its population or whether it’s going to start growing. The city needs to think strategically about different ways to make Detroit a destination. It already has many wonderful attractions coming into downtown and downtown Detroit is becoming a thriving and more expensive place to be, but much of the city remains as it has been. It’s still struggling with the resources or investment that it needs to thrive. Creative solutions like an equestrian facility should be able to attract residents to come or to stay, as well as new forms of investment that can come around this really attractive place to be. Romy: There’re obvious distribution and employment it creates and vendors around it that aren’t here right now. As you said, unless it’s a pop-up type of event, right? Romy: Would you say since you started this concept, you and I connected, I don’t know, a couple of years ago, maybe a year and a half ago, how has the reception been as you’ve gone out and talked about this because I can just imagine for those folks who know Detroit to think about that and Detroit is really both exciting and thinking, “How in the world would that happen here?” but how has the reception been when you’ve gone out to try to raise some capital around this? David: The support we’ve gotten has been overwhelmingly positive. I’ve been very grateful for particularly folks in the Michigan horseback riding community who this really resonates with because they already know horses are good for people, and they have some connection to the City of Detroit. Using horses to benefit kids in this city is a natural thing for them to get involved with. They’ve been overwhelmed with the support of volunteers, of people willing to let us use their horse barns, or their horses, or their equipment, and also the donations that make our programs possible at this point. Then, broadly speaking, there are many Detroiters who their have themselves a connection to horses because of a lot of times family connections in the south or have always dreamed of having access to these exciting opportunities. We’ve been building quite a broad coalition of folks that want to see horses be a part of a stronger future for Detroit. It’s been about a year since, I think, we met at the end of the Build Social class. This is a relatively new organization. We incorporated, and we receive tax-exempt status in April of 2015. We’ve been growing quickly, and we’re fortunate to receive initial small grants and donations that allowed us to launch last year, and since then have fully funded out Summer 2016 programs, and are currently raising money to expand our impact with an afterschool pilot which will launch in the fall of 2016, and continue through spring 2017 as we begin to demonstrate what a year-round program would look like. Even though we don’t have horses in Detroit yet, it’s very important for us to be collecting those stories and narratives, as well as the data we’re able to collect on the impact this can have for our kids. That’s been a big point of feedback we’ve gotten from some of the large philanthropic stakeholders who are supporting Detroit is they’re very excited about this idea, and they want to see a track record of demonstrated impact to get involved in a big way. We are very dedicated to proving how powerful horses can be for our kids through these pilot programs. I’m very excited to see where this is going. Romy: How are you taking which kids get to be in the program when there are so many here? David: We got started last year with two community partners. The first was Alternatives for Girls which is a terrific nonprofit in Southwest Detroit who took a bit of a gamble on us. We hadn’t done any programs before but were willing to. They believed in what we were doing and how this could really impact their girls. That program was really wonderful. The second program was with former students of mine actually from Burns Elementary and Middle School on the west side of Detroit. That was doubly meaningful for me because I had left teaching to start this new social venture and that was a very difficult decision for me because my kids were always what had made teaching so important. To include them in this new work that I’m doing now really meant a lot. Those two stakeholders helped us pick which students got to participate in our camps. Like I said, I’m very grateful that they believed in our work in our first year. As we’ve begun to show how much kids enjoy and benefit from these programs, the interest from new community partners has been really overwhelming as we look ahead to our 2016 program. We’ll be working with Alternatives for Girls and Burns again this year, as well as adding two new community partners, but there’s a list of probably a half-dozen organizations that I would love to be working with, but we just don’t have the capacity at this point. We’re looking forward to growing in the future because there certainly is a really high demand. Romy: Yeah, I could just see this program, something Detroit really needs, desperately needs. I’m sure almost every community, now that I say that out loud, could really use a program like this. I’d like to do it for myself. David: To back off that, like I said earlier, I feel very fortunate that I got to grow up around horses. It’s something that I consider a real privilege in my childhood. Being able to pass it on to kids who don’t have the same advantage as I grew up with is very important to me on a personal level. The work we’re doing now is directly tied to what horses have meant to me in my life. Romy: David, just for the people who don’t know the terminology of the Three-Day Olympics, will you tell us what that was that you did and what part of your life you did that in? David: Sure. Three-Day Eventing, it’s an Olympic sport. It’s a horse triathlon. The first part is dressage which is fancy horse dancing. It’s a bit like figure skating in a way and that you’re doing a set routine, and there’s a judge, and they’re giving you a score on each movement. The second phase of Eventing is cross country. That’s where your galloping through fields and jumping over natural obstacles like tables, and hedges, and water, and things like that. Then, the third phase is stadium jumping. That’s in an arena with jumps that fall, and you get penalty points if you knock them down. You’re doing all three phases, the same rider riding the same horse. It really is the complete test of horse and rider because there are so many different ways that you’re challenged. You need the grace of the dressage and the bravery and endurance of the cross country, and then the precision and the athleticism of the stadium jumping. I started Eventing when I was 14. My competitive career ended when I was 19. I got to work for Olympian Boyd Martin. My horse, Russian, I got to a reasonably high level. We placed well at a one-star competition which is the lowest level of international competition, with four-star being the Olympic level. We had reached both of our competitive ceilings if you will, and that was at the end of the summer of my freshman year of college and was going back for my sophomore year, and really wanted to make the most of my college experience. I feel very grateful that that was a big part of my life growing up. Romy: You’re the perfect leader for this. You love kids, you love teaching, and have this great competitive and bonding with the horses, and growing up around them. You’re the perfect person to show kids how to walk into that relationship with the horses. David: I feel very fortunate to be able to do this work which is so closely aligned to what I’m passionate about. I’ve had such powerful experiences with horses with growing up, and such a commitment to working with underserved youth, and feeling a very strong connection with the City of Detroit. This really brings all three of those parts of my life together, and not everybody gets to do work that so closely aligns with their passion. I do feel very fortunate. Romy: I find when I go out and work with or connect with leaders who are that connected to their passion, they’re working in that level of alignment, it’s almost an organic byproduct that they easily raise the bar of hope for those that they’re working for. Because it sets the bar much higher, many children in Detroit have never probably even thought that you could work with horses in an Olympic sport. Just the fact that you’re sharing that story, and it elevates what could be for them. I think, gosh, for most of us as human beings, we want to have hope set for us and be a challenge to dream bigger. David: Yeah, it really does open a lot of horizons for our kids in Detroit who often don’t get exposed too much outside of their neighborhood. To be transported, if you will, to a very different setting when it’s just very outside of their comfort zone, it requires a lot of personal growth. There’s a lot of personal growth that comes with stepping outside your comfort zone and to be exposed to things that are very different from what you see day-to-day in Detroit. When we bring in guest speakers to talk about different equine professions, some of our kids have been so moved by the opportunity to work in a way that aligns with your passion. They want to become veterinarians, and we’ve been able to break really that down, and what are the steps that a veterinarian takes to complete veterinary school. You have to have an undergraduate degree. What do I need to do to get an undergraduate degree? You think backward math from there. Whether it’s a horse-related profession or not, setting the bar and having mentors and examples in your life that you can look up to is really critical for everyone, and especially our kids in Detroit who are often lacking those role models and strong forces in their lives. Romy: You reminded me years ago, I met a horse acupuncturist. My first thought is, “How did you even think of that?” He said someone had come through in his childhood, and it exposed him to that and talked about the gap and the need for that work. That’s what he did for a living, but because somebody came along and painted a picture of what could be. I don’t know. I was just reminded of that. Changing gears a little bit, has anything really surprised you about starting this journey or did you see most of this coming? David: It’s been a journey certainly. This work is very different from what I’ve been doing before in terms of writing grants, and forming community partnerships, and engaging with our political leaders. There’s a lot that’s been new. Some of the biggest lessons learned are certainly, a strong confidence that I am the right person to be leading this effort, and I have a skillset that offers a lot to our mission, but it can’t be me alone and that there are so many people out there who know way more than I do and have experiences that are essential to helping Detroit horsepower thrive. Being a part of a network and really building that coalition of folks that strongly believe in what we’re planning has been essential. You can’t necessarily plan for all the steps and the hurdles along the way but with the spirit of staying humble and seeking to learn from others who know more than I do, I know that we’ll achieve our goals. Romy: That is for sure. We talked about you at our firm of how humble you are. For listeners who don’t know, he’s in the news a lot, he’s got a lot of media around him, and he’s so humble, so humble and so positive. Anything else you want to say about challenges or things that you’ve experienced? David: We’re always looking for more folks that want to support what we’re doing whether that’s keeping in touch with us on our Facebook page or signing up for our email newsletter through our website which is detroithorsepower.org. We’re always looking for volunteers who want to get involved with our youth programs, or if you are able to contribute financially to making our programs possible, we can take donations online. It is within that spirit that we need a broad group of folks that want to lift up our work. I’m very grateful to Gingras Global for creating this platform for us to share our story, and it’s with this opportunity and so many others that we can together reach these ambitious goals for using the power of horses to make an impact in the lives of Detroit’s kids and communities. Romy: We’re going to see you all over the place. We’re just glad to be a part of it and catch you on the rise. Before we close out, would you let yourself dream big, your truth of the moment, with what you know today, would you let yourself, if you had a resource, and that what could this look like someday when you’re privately dreaming about this? David: My vision for what Detroit Horse Power looks like when we’ve made it when we’re truly successful is that kids who come up through our program and have benefited from their experiences with horses and developed valuable skills. It’s when those kids are teaching the younger kids in our program that don’t really know that we’ve arrived. It’s really about building change in our community, and the horses can offer so much there that’s deeply powerful. The self-reflection opportunities and the personal growth is an enormous opportunity, like we said, for anybody but particularly for kids in Detroit. My deepest hope is for this to affect change in the lives of our young people in the city and to help with the revitalization of our communities that are not seeing the attention and the investment that they need to thrive so that we can have safe, productive communities for all our residence and horses can be a big part of that change. Romy: I’ll tell you, I’m dreaming big. I want to have an event there once you get it open. We’ll have a podcast event there with bonfires, and a lot of fries, and a big fire in the middle of the horses and all that. David, thank you so much. I appreciate this. It’s been a real honor. We’ll check back with you and document your journey in this podcast.